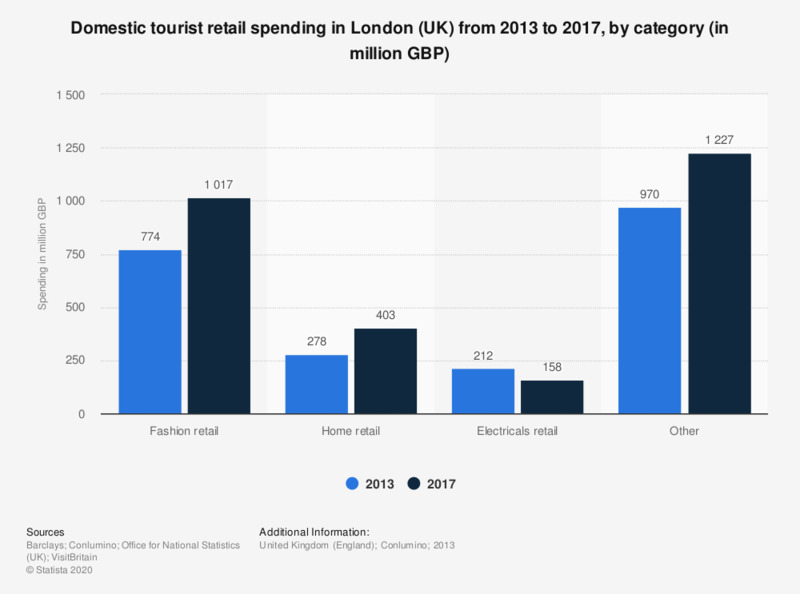 This statistic displays the value of domestic tourist spending on retail in London (UK) in 2013 and with a forecast for 2017, by category. Fashion retail saw the highest amount of retail spending by domestic tourists in 2013 at 774 million British pounds. This was forecast to rise to over one billion British pounds in 2017. Home retail was also expected to see growth in domestic spending. Electrical retail however was predicted to fall by approximately 54 million British pounds. London is the most visited English city for domestic tourism in Britain and average spend per visit has presented an increase over several years. Along with New York and Milan, London is considered to be one of the world’s leading shopping destinations. The city has an array of premium shopping locations, including Oxford Street and Knightsbridge, home of the high end department store Harrods. Although fashion is the most popular category, other retail sales, including luxury food and drink, are also expected to rise due to domestic travelers in 2017. Comparing the data with inbound tourism data, international tourists recorded a higher spend on fashion than domestic tourists in 2013. This was also expected to increase in 2017, while spending on electrical items was due to decrease.